We finished our second session in a six-week series in Adult Education titled “Making Sense of the Cross” this morning, focusing today on how each of the four gospels presents the story of Jesus’ death and resurrection a little differently (or a lot) because of the particular confession of faith each author was trying to make in response to the needs of very different communities. For example the gospel of Matthew, from which we’ve been reading since the beginning of Advent, was very likely written to a community of believers who were mostly Jewish in their background and therefore more familiar with the sacred texts of Hebrew scripture which we often call the Old Testament. We see evidence of this in the number of times that the author offers an explanation for powerful events from Jesus’ life by saying something like, “this has taken place, so that the scriptures of the prophets may be fulfilled” (Matt. 26:56). This morning we move from Matthew’s gospel to the gospel of John, from which we’ll be reading through the rest of the Sundays in Lent until Palm Sunday. The gospel of John was written about twenty years later than Matthew to a different community facing very different circumstances. Like Matthew’s gospel, John is believed to have been written to a community of Jewish believers, but ones who had experienced significant conflict with the rest of the Jewish community, perhaps having been removed from the synagogue for their conviction that Jesus was the long awaited Messiah. You can often hear in both gospels subtle or outright hostility toward people labeled “the Jews,” though we should understand in both cases that the author and the intended audience were also Jews, at least by birth, and would have been treated as such by the rest of the Roman-occupied world. The anger and conflict we hear behind the words of both gospels are less like the violent forms of anti-Semitism that led to pogroms across Europe and eventually the horrors of the Second World War (though passages from these scriptures were used to fuel those campaigns), and more like the kinds of conflicts that tear churches apart — conflict between family members who know each other only too well. 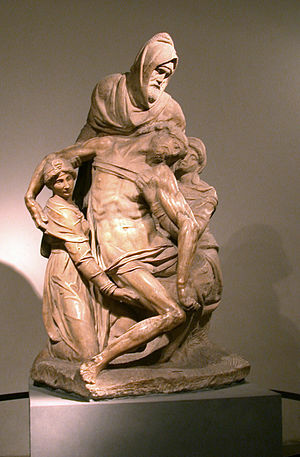 Nicodemus helping to take down Jesus’ body from the cross, Michelangelo Pieta. Nicodemus comes to Jesus under the cover of night, confessing that Jesus’ acts of power of signs of God’s presence and trying to understand what this means. Jesus responds to his honest curiosity with a cryptic statement, “no one can see the kingdom of God without being born from above” (John 3:3). If any of you come from one of the many “born again” traditions of Christianity, then this is probably a familiar passage of scripture. Over the centuries it has been used to justify the practice of adult baptism as a response to Nicodemus’ question, “how can anyone be born after having grown old?” (3:4) Our response as Lutherans to our sisters and brothers who ask, “have you been born again?” has never been very satisfying to them, since we understand the process somewhat differently. We say, along with Martin Luther, “yes, I’m born again every morning as I rise to wash my face and remember that I was baptized.” Our practice, and the theology that arises from it, is rooted less in Nicodemus’ question and more in Jesus’ answer: “Very truly, I tell you, no one can enter the kingdom of God without being born of water and Spirit” (3:5). But what is even more ironic is that this kind of intra-religious conflict reveals a tendency in us all to lose sight of what Jesus is actually trying to communicate, which is that God is not in the business of taking sides in our self-righteousness projects. Rather, in Christ Jesus, God is showing us God’s love for the whole world, those we agree with and those we disagree with, our friends and our enemies, the “good” and the “evil.” All of us. Everyone. This is the point Paul is making in his letter to the Romans. If it is the adherents of the law who are to be the heirs, faith is null and the promise is void (Rom. 4:14). In other words, when we turn our faith in God into a set of rules and practices about God that must be followed in order to get to God, then we have taken faith — which we might also call loving-trust or loving-reliance — out of the picture altogether and have turned grace into a scorecard. But to one who without works trusts him who justifies the ungodly, such faith is reckoned as righteousness (Rom. 4:5). Paul suggests that even the act of sorting out who has the right set of beliefs can itself become a kind of works righteousness. “Abraham believed God,” — not Abraham believed in God, but “Abraham believed God.” It makes all the difference. It is the difference between “Abraham held the right set of thoughts and ideas” and “Abraham trusted that God is faithful” — “and it was reckoned to him as righteousness” (Rom. 4:3). And all this talk of Abraham begins with a story that calls each of our allegiances to religion, nation, politics and land into question. God says to Abram (whose name has yet to be changed), “Go from your country and your kindred and your father’s house to the land that I will show you. I will make of you a great nation, and I will bless you, and make your name great, so that you will be a blessing” (Gen. 12:1). The church, the nations that have emerged in the shadow of the church, and we ourselves have often been more interested in the second part of that story, the idea that we belong to a great nation — be that religious or secular — and that we exist as a blessing for others, a slippery slope that too often has led to all kinds of colonial disasters. But what about the first part of that story, the deep faith that enabled Abraham to leave everyone and everything he knew behind: his country, his family, his good name. Stripped down, almost as naked as Adam and Eve in the garden, left with only his trust that God was for him and would not forsake him. Are we ready to take that trip? Honestly, I doubt it. Like Nicodemus, we see the power of God at work in Jesus, but we trust in our own abilities, our own beliefs, to get us closer to God. Thankfully, God is taking a trip as well, crossing every barrier that divides heaven and earth to be with us, to be for us. “Indeed, God did not send the Son into the world to condemn the world, but in order that the world might be saved through him” (John 3:17).